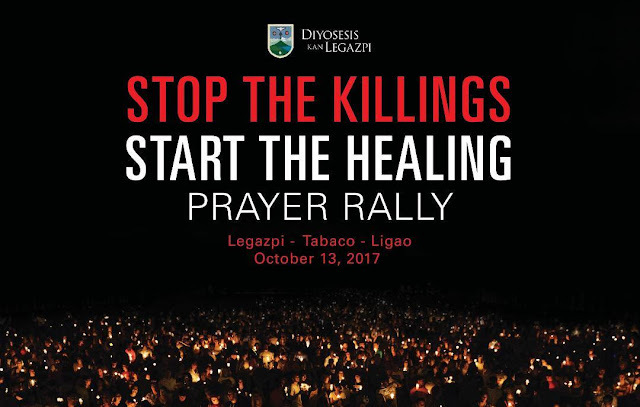 LEGAZPI CITY (October 13) - Simultaneous prayer rallies will be conducted by Catholic faithful and religious in three cities of Albay today, to stage a campaign for a call to STOP the KILLINGS under the Duterte administration and START THE HEALING to enjoy a peaceful life. In an interview with DZGB News , Father Rex Arjona, executive director of the Social Action Center and spokesperson for the Diocese of Legazpi, said the activity was a church-based campaign to raise consciousness among the public on the spate of killings arising from the government’s war on drugs. 'We would like to awaken the people’s mind to our shared responsibility to stop the killings and start the healing process,' Arjona said." Earlier Bishop Joel Baylon announced over DZGB News that the prayer-rally starts at 3:00 PM in various gathering areas followed by a march towards Tabaco Church in the First Vicariate, and Albay Cathedral in the Second Vicariate. The Third Vicariate participants will stage a motorcade from their parishes to Albay Cathedral.